I wasn’t planning on doing this challenge initially. While thoroughly enjoying a lot of the other bloggers posts on perspective, I figured why not try it out. This is actually my first challenge post ever. 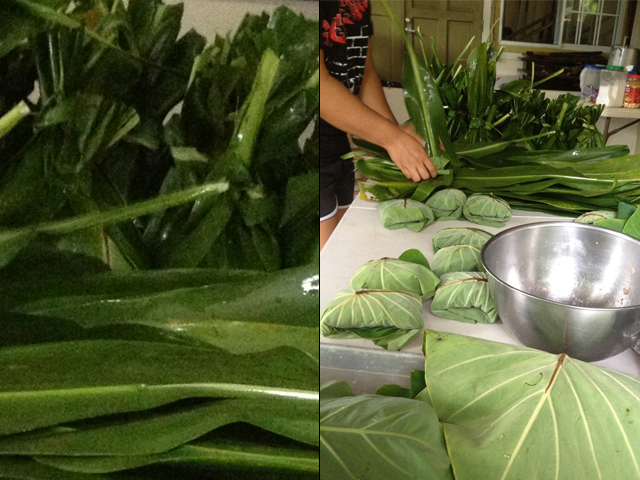 In this photo, I chose to focus on the leaves that the laulau (fish in taro leaf) is wrapped and cooked in. The ti leaves, which are focused on in the photo on the left cut out from the main image on the right, are used in so many ways. It can be used to make clothes, for cooking or even for massages. I remember growing up my grandma would make me collect ti leaves to use when massaging my brothers when they were sick because the coolness of the leaf absorbs the heat from the body. That’s beside the point. The point of this photo is if I had only shown the ti leaves you would’ve probably thought “why is she showing pictures of some bush/grass?” It’s the type of leaf I was focused on. It’s sleek but strong texture makes it the perfect insulator. This leaf is not just a regular leaf. It’s part of something bigger and very delicious.